This is another compelling thriller/mystery in the Brit in the FBI series. This one involves ancient writings as understood by a madman who inflicts his mania on the world, injuring, killing, and putting many at risk. Nicholas and Mike rush in to help and unravel what is happening. This is a quick read, but with a complex back story regarding the Voynich Manuscript and hemophilia. I love this series, but found this one not quite as engaging as the prior books - I'm not really sure why, it just took me longer to get into it - but by the time I was a third through the book, I was completely engrossed in the story. Fans of the genre will want to read this novel. The authors are on my must read authors' list. I didn't like this book at all. I much prefer when Catherine Coulter writes on her own. This book was too long with unnecessary details and a very complicated plot with so many different people involved. It took ma a very long time to read it and I usually can't put Catherine Coulters books down. I was really disappointed in it. Wonderful thriller. I never realized Ms Coulter wrote these books. Must find more. 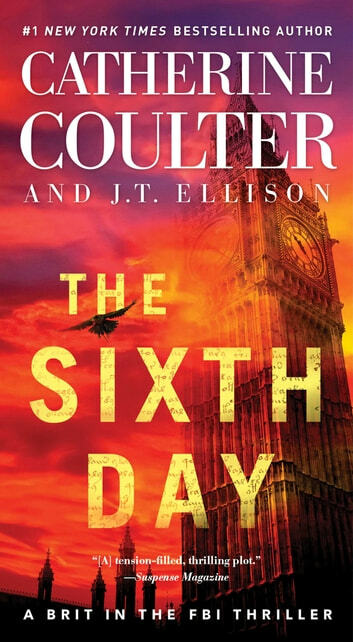 The Sixth Day is the latest FBI thriller from authors Catherine Coulter and J. T. Ellison. The Sixth Day mixes history with fiction for a story that often has you on the edge of your seat. This is a stand alone story that makes you think about today's technology in the wrong hands. I was given an early copy to review.